Jason Ditto stands next to his Eagle Scout project. DELPHOS — Jason Ditto, 17, wants to be an Eagle Scout. He’s currently a Life Scout. Every Eagle Scout candidate must do some kind of community project. 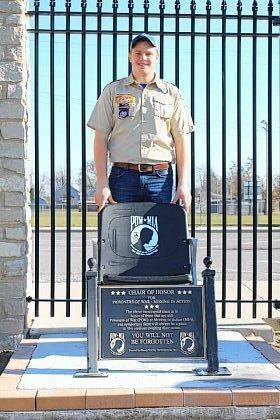 The Delphos Jefferson student’s project is to place a memorial chair at Delphos Stadium. “It is is a Chair of Honor. It’s an empty chair that’s placed in the stadium as a reminder to the community members about the veterans and their sacrifices, the veterans that were taken as prisoner of war or are missing in action,” Jason said. So why did he choose this project? “There was a gentleman that I go to church with who had seen similar things in other stadiums and it’s something he was interested in and thought it might make a good Eagle Scout project. He mentioned it to me and I really liked it and so I just kind of went with it,” he said. Moving the project from an idea to reality took some effort. You can find the chair at the east side of Delphos Stadium by the flag poles. “My next step is to have my project signed off as completed and satisfactory and then I will have to fill out my Eagle Scout application and turn it in. After completing a Scoutmaster Conference with my Scoutmaster, he’ll sign my application and they will put people together for a Board of Review and from those two interviews they can say whether or not I am ready an Eagle Scout,” he said. Jason said he’s gotten much out of the scouting experience. “Scouting is important to our community and our nation. It teaches young men important values for life and it’s something that everybody needs to learn at some point so for me that’s what scouting is. It’s teaching me what I need to do to be a respectable, honest adult and a good citizen,” Jason added.